I finished up my usual dailies, queued for the Brewfest Holiday boss (no Ram mount or remote but I’m still thrilled about getting the Kodo) then queued for the usual Random LK Heroic and got H The Culling of Stratholme. I was happy to get this instance because I really didn’t feel up to the usual “wipe fest” that normally accompanies H Forge of Souls and H Pit of Saron, although the last time I got H FoS it was the first time I was in a group that completed it without one wipe. I’ve run the CoS on both normal and heroic modes a few times so I’m familiar with the boss mechanics, and that makes healing it a lot more enjoyable and fun. When he said “fast” he wasn’t kidding – he took off like a rocket but he was obviously over-geared for this instance and knew exactly what he was doing. Usually I get a few zombies smacking me around but the DPS were also on top of their game and burned down the mobs faster than I could hit my “Fade” key. It was quite enjoyable. No one was taking very much damage so I didn’t have to keep my eyes glued to the healing grid. I actually got to – gasp! – see the bosses and watch the action! In the more challenging instances (for me) it can get a bit stressful keeping up heals while dancing around boulders, avoiding goo and running from whatever nasties are tossed at the group. Between watching my healing grid and trying to maintain situational awareness, well, let’s just say I’ve been in a lot of content I haven’t actually seen yet! So…there is something to be said in favor of over-gearing for an instance. Perhaps it’s not challenging anymore or too much “easy” mode for some players, but for me it was a nice change to relax and just enjoy the show. Before last night I hadn’t even noticed that when the instance converts my Draenei Priest to a Human Priest – I have red hair! I needed to catch some fish to stock up on some Priest “buff” food and if I was out fishing anyway, I might as well finish up a few more Fishing Achievements. 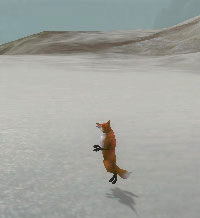 I started in Ferelas as I needed to fish from one last Floating Wreckage pool for The Scavenger Achievement. 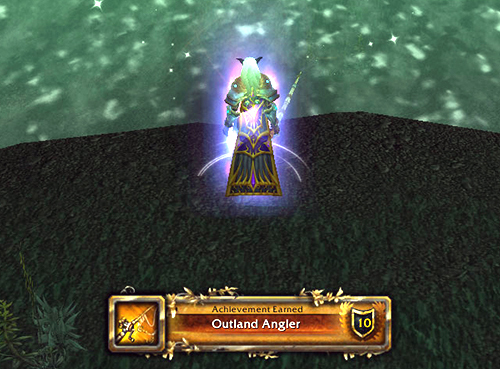 Next, it was off to Outland to fish a few pools I needed for the Outland Angler. 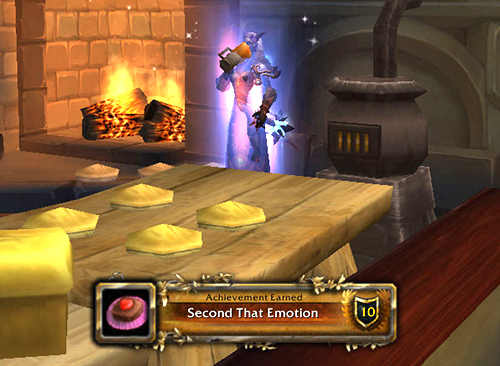 Last, back to Northrend to find a few “cooking” fish I needed to work on The Northrend Gourment Achievement and complete the Second That Emotion Achievement. I only had two fish pools left to find for the Northrend Angler Achievement – Moonglow Cuttlefish School and the Deep Sea Monsterbelly School. I flew out to the Frozen Sea, found a nice iceberg surrounded by both pools, and started fishing. 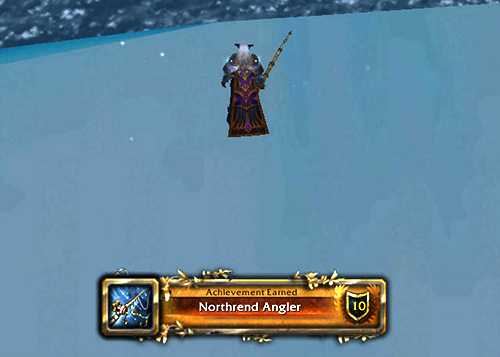 An Achievement notice popped up so I grabbed a screen shot and kept fishing as I assumed it was the Northrend Angler I had completed. 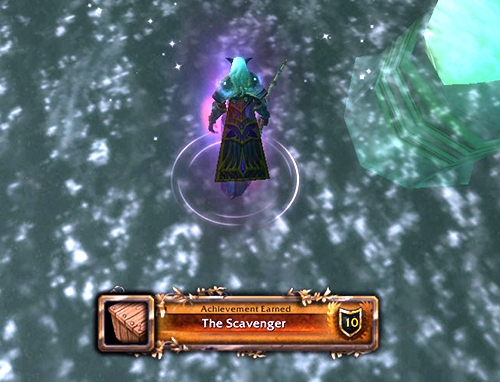 A few seconds later a second Achievement pops up – the Northrend Angler. 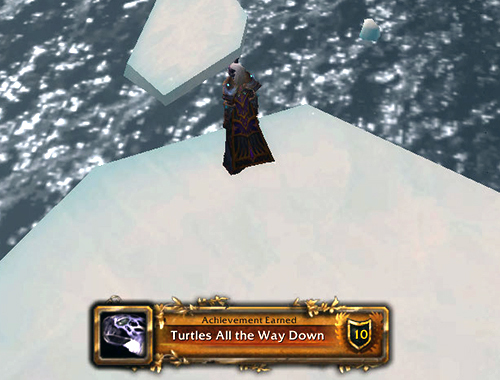 I checked the screen shot of the first Achievement notice to see what it was – Turtles All The Way Down! 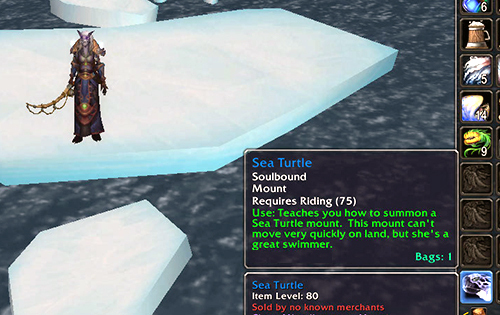 I looked in my bags and sure enough – there was the Sea Turtle! 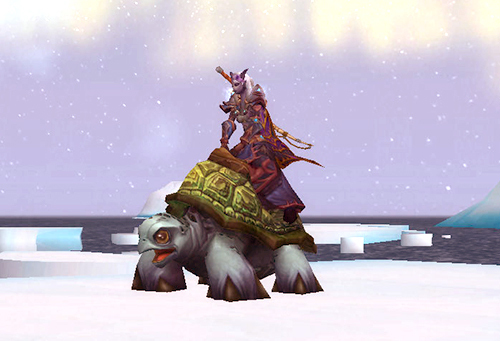 I had almost given up trying to get the Sea Turtle mount for my Priest after fishing off and on for a few months looking for it, so I’m happy to finally get it! I must be really pushing my luck to get the Brewfest Kodo and the Sea Turtle the same week, but the Random Number Generator is random! I never stop and leave comments on peoples sites but I just felt the need to say that I absolutly love your. I think you are doing a wonderful job on it. Keep up the good work I can’t wait to read more from you. Great post! 🙂 Grats on the turtle too!